My boys are at that age, 5 and 7, where they need to be entertained all the time. 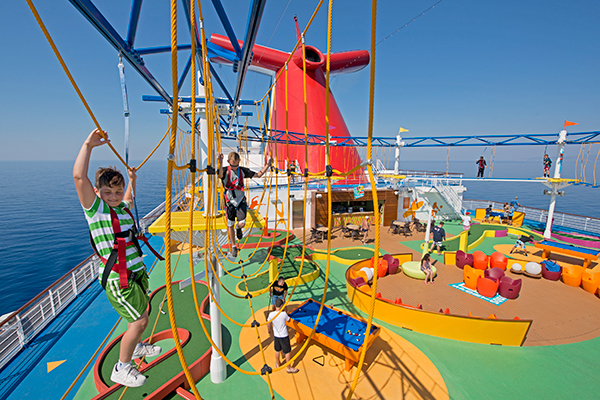 There’s no sitting and resting for this crowd and that’s why we chose the Carnival Breeze. 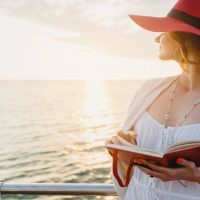 There are tons of choices–in dining, activities, and shore excursions–and boredom never has a chance to set in. The new (the inaugural cruise was in 2012) 3,690-passenger vessel has year-round six- and eight-day Caribbean cruises launching from Miami. 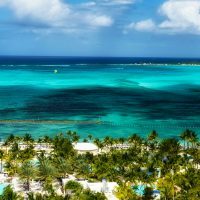 Here, what makes Carnival Breeze a good choice for the whole family. As anyone with young kids knows, vacation camp can really go either way. If you have great counselors, kids will want to come back. Otherwise, it’s a battle each day. The counselors at Camp Ocean quickly learned all the kids’ names and interacted with each child. My son Matthew was eager to join his friends at camp each day and often didn’t want to leave when we picked him up. He made tons of art projects–T-shirts, whale banks, pirate drawings–and loved the staff interaction. My son Jack, who is older, lost his tooth one day at camp and not only did the staff make a big deal of it (everyone oohing and ahhing over the new front gap), but they gave him a “tooth case” to keep his tooth safe and secure until the tooth fairy could arrive. Jack also loved the games (trivia, boys against the girls) and the video games and scavenger hunts. 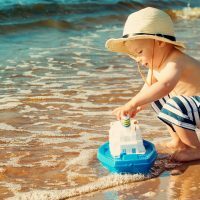 But, of course, if your child decides not to do Camp Ocean, there are still plenty of other activities aboard the Carnival Breeze to keep them busy. WaterWorks: This outdoor aqua playground includes a giant 312-foot twister slide, a tipping bucket, a splash zone and sprinklers. What’s not to love? My boys spent a good chunk of time each day in this area. SportSquare: This open-air recreation complex has it all: a suspended ropes course, mini-golf, jogging track, Ping-Pong, pool, and foosball tables. Seaside Theater: What could be better than watching a movie from a pool? The 270-square-foot LED screen offers nightly “Dive In Movies,” complete with popcorn and drinks. Thrill Theater: This interactive movie theater lets kids feel like they are part of the movie (surcharge applies). Serenity, the adults-only section of the ship, was a popular spot. It offered great views, plus plenty of comfortable spots to hang out, including day beds and plush chaise lounges. Add to that a dining area with salads, wraps and other light fare, plus plenty of warm breeze, and this was a sought-after tranquil section. The Cloud 9 Spa not only offered a large variety of treatments, including a bamboo massage which incorporated heated bamboos to treat sore muscles, but the water area was a great spot to lose yourself for a few hours. You can buy a day pass and utilize the steam rooms, Turkish bath, whirlpools and heated relaxation stone chaises for some rest and relaxation and pampering of the body. 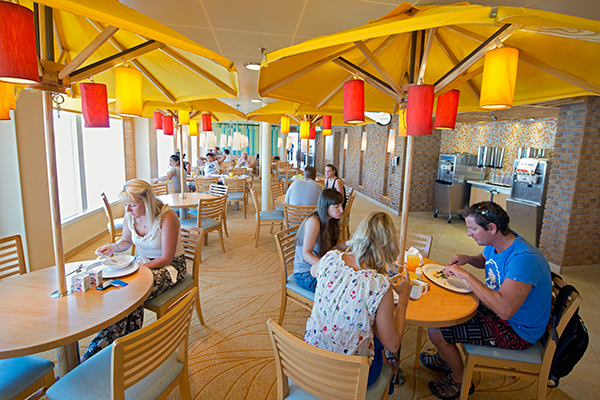 There are several dining options available aboard the Carnival Breeze. We picked the 6 p.m. dinner time slot and were assigned the Blush dining room. However, my husband and I loved the feel of the Sapphire dining room (it has a more traditional cruise feel) and we asked the hostess at Sapphire if there was any way to switch us. She didn’t promise us anything, but the next day, they were able to put together a table in the corner, perfect for high-energy boys who don’t always behave at dinner time. The waiters soon got to know us (I ordered anything in the “exotic” section–rabbit, escargot, beef tongue), and they soon took to recommending certain dishes based on my palate. The kids were happy with the many kid-friendly options (chicken nuggets and banana splits) and the service was really great. Fahrenheit 555 – When traveling with kids, sometimes parents need some alone time and nothing says date night like a classic American steakhouse. This restaurant offered my favorites (crab cakes and tuna tartare as appetizers, followed by filet mignon), as well as an extensive wine list (surcharge for this restaurant). Cucina del Capitano – This Italian restaurant offered a free pasta bar at lunchtime (which was super popular) and turned into a cozy restaurant later in the day (with a surcharge for dinner). The appetizers–the antipasto platter and the calamari–were delish. Guy’s Burger Joint – Another favorite for my family was the fresh-made burgers, hand-cut fries and innovative toppings. Created in partnership with Food Network personality Guy Fieri, this outdoor venue was a big hit throughout the day. BlueIguana Cantina – I love Mexican food, so this taco and burrito stand, complete with an extensive salsa and topping toppings bar, was yummy and a great go-to spot during the day and for late-night munchies. Lido Marketplace – Buffets are always a good bet when traveling with kids. They get to sample a little of everything. The kids loved the yummy made-to-order pizza at the Pizza Pirate, the create-your-own stir fry at the Mongolian Wok and some tasty nan at the Indian Tandoori section. Bonsai Sushi – Carnival’s first full-service sushi restaurant offers sushi, sashimi and other Far East delicacies in this new restaurant (surcharge applies). 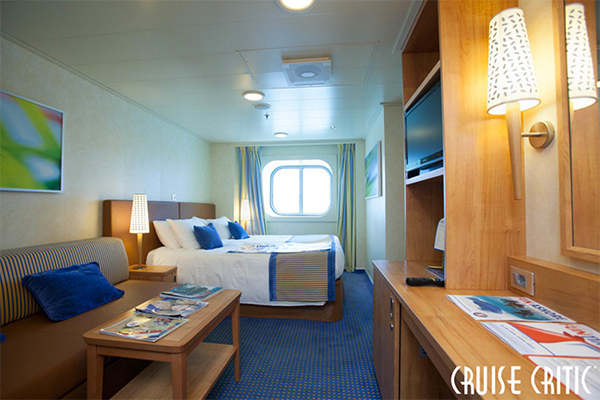 Junior Suite: sleeps up to 3 people, has a full-size balcony, a walk-in closet and a whirlpool bathtub. Ocean Suite: larger than a junior suite, this option sleeps up to 4 guests, more room both indoors and out, and VIP check-in. Grand Suite: this large suite sleeps up for 4 and includes a dressing area with vanity, a large balcony, and plenty of room for toys and clothes. Whether it was sleeping in their ceiling bed, playing in Camp Ocean or getting soaked in WaterWorks, the kids had a great time aboard Carnival Breeze. For adults the spa, serenity area and variety of restaurants is a big draw. For couples and families, the vast variety of options, combines with great service, makes it a no-brainer getaway.